Daniel French's third season of Caterham Racing. Competing in the 2019 Motul 270R Championship. 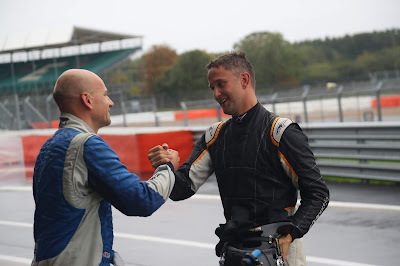 This blog shows my full Caterham Journey from the build of the awesome R500 Duratec, the Academy Car in 2017, track day information, videos and race results. 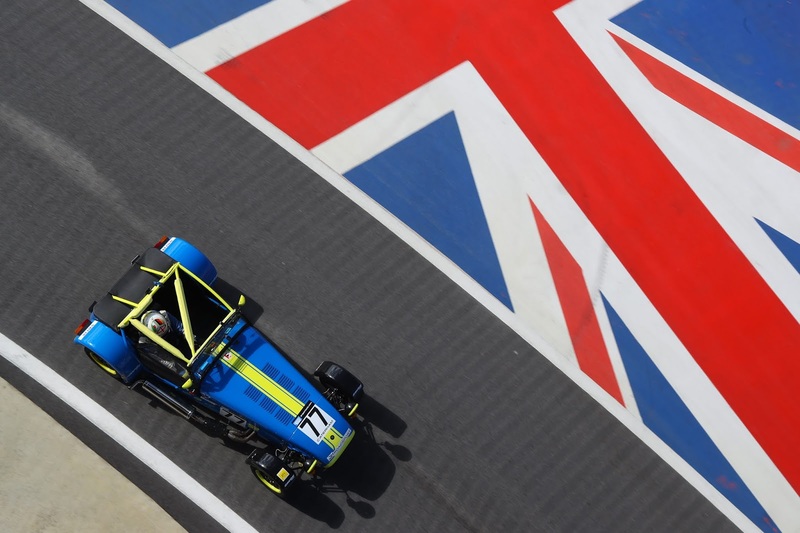 The Final Round of the 2018 Caterham Roadsport Championship was at Silverstone International Circuit. I arrived on Thursday evening, got setup and ready for one day testing on the Friday before the race weekend. Testing went well, I had my setup sorted, an awesome looking set of dry race tyres, a set of brand new tyres (in case it was going to be wet), and I was feeling confident and on top form with a view of clinching the title as it was going to go down to the last race. As we went to the holding area for qualifying the rain started to drop, so it was a wet qualifying session. I seem to have a good feel for the car in the wet, so managed to qualify on pole by six tenths from P2 qualifier Daniel Halstead. The race was going to be wet, and I went with what I thought was going to be a good setup, red front anti roll bar (medium) and full stiff on the rear (which is pretty much a dry setup). I started well and got a good lead, but as the track changed towards the end of the race, my setup didn't work as well, with my lead eroding lap by lap. James Murphy put a late move on me into Vale on the very last lap, which I didn't think would stick but did, so I ended up finishing P2, with James also securing fastest lap (worth one additional point). 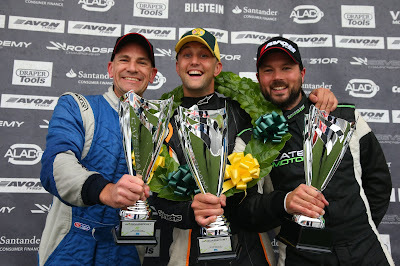 2018 Caterham Roadsport Race 13 podium (l-r) Me! P2, James Murphy P1, and Toby Clowes P3. So onto the FINAL Race of the 2018 Caterham Roadsport Championship - race 14... I needed to win this race, and attain fastest lap (which is worth one point) to be crowned 2018 Caterham Roadsport Champion. I drove the wheels off the car, finishing 26.4 seconds in the lead and held the fastest lap for most of the race (without a tow), so it was great to go out with such a dominant victory. 2018 Caterham Roadsport Race 14 podium (l-r) Oli Pratt P2, Me! P1! and Neil Frazer P3. How did the championship unfold? An un-diagnosed problem with my gearbox at both races at Snetterton (third was engaged, but box was neutral) - gearbox was replaced. Missing out on fastest lap in the last race by 0.028 of a second (without a tow), which was worth the point I needed. 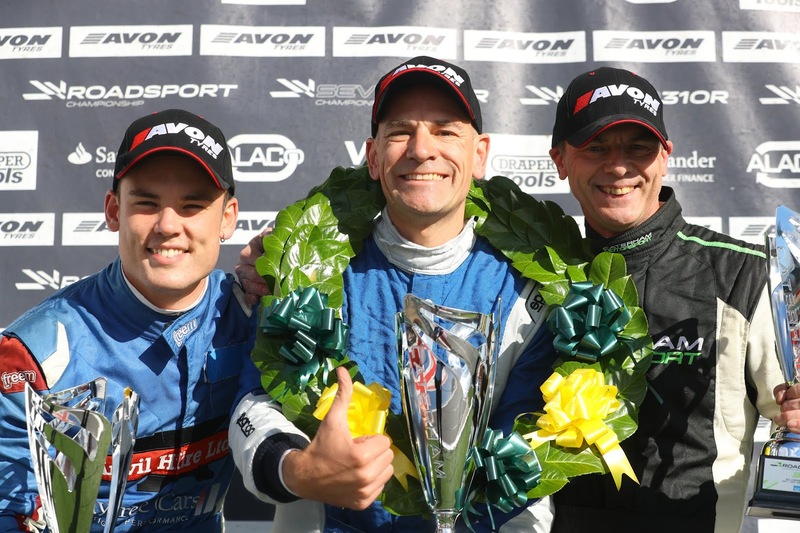 The season couldn't have been closer and congratulations to James Murphy who has driven brilliantly all year - he is crowned 2018 Caterham Roadsport Champion. The car is going to be upgraded to 270R spec over the coming weeks, and I intend to fight for the 270R championship in 2019 which I'm already fired up for, so bring it on. Thanks for your comments, I'll check out what you've written and add it provided it's useful informative and not spam. What does a 'Superlight' R500 Duratec weigh?